When you are ready to add your custom content to the galleries in your design you will first want to click to select your gallery. Next we will swap the default content in the design with your custom content by following the steps below. Click to select the gallery you want to edit. Then under the "gallery images" tab in the right sidebar, click the blue "manage images" button to open the gallery manager window. Hovering over the image will display the action box with the check mark option to select your images. Click the check mark for all images you wish to add to your gallery. Click the blue arrow to move the images over into the gallery area. 3. 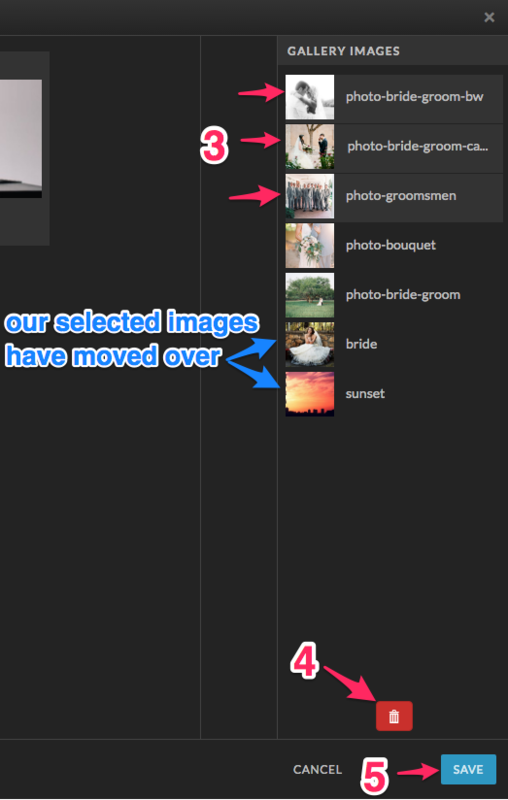 Hold Shift + click on the photos you want to remove from your gallery to select multiple images at once. 4. The red trashcan button will then appear, click it to remove the images from your gallery. 5. Click the save button which will exit the gallery manger window.